After camp at Forest rd, a nice spot, a real surprise, with a shelter and picnic table, beside fresh running water, we headed for Jacksons crossing. We saw Forks rd, which goes nowhere in particular but is supposed to have views of the Tulloch Ard gorge, had been resurfaceced very nicely with white sand and decided to investigate. Found that a short way down South Fork rd a walking track is being put in, presumably to access the views of the gorge. Path being cut through the forest, and cypress benches already on site, ready to go in. We found Monument track, which had some very steep and soft sections descending to a helipad that should have overlooked the snowy river rapids but was too overgrown to see anything much. The rest of Tulloch ard really is a stunning forest drive, like the very best of the Dandenongs. Tall timber and good road for the most part. Then we were at running creek track which leads through private property to Jacksons crossing. 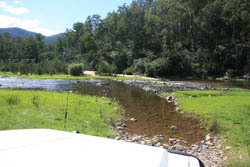 The track is steep and rocky for most of the length, and then as it comes onto private land becomes a farm track over paddocks, before turning down to the river. Of course there is no water in the mighty snowy, so Jacksons crossing was, like all the other crossings so far, no trouble. However not hard to imagine that with another foot or so of water flowing, negotiating the entire crossing would be very interesting!! As it was here were just two short crossings just a few inches deep. Continued on Varneys track , 4wd, to Yalmy rd, 2wd but with rough patches, and found Waratah Flats campsite. Very nice. Looks very underutilized too. Water from Rodger river is good but not right by the camp. Set up here for three nights, doing day trips over Deddick Trail and Mt Tingaringy.